I always knew Irish people had an unusually extensive preoccupation with the weather, but it didn’t quite sink in until we opened the shop. Maybe it goes back to Oiche na Gaoithe Móire and the terror of that and other climatic catastrophes affected our DNA to the extent that we are now concerned daily about the weather past, present and future. My grandfather used to say he remembered ‘The Night of the Big Wind’ well, despite the fact it happened on the 6th January 1839! The thing is, I now realise my own preoccupation with the weather and that I do at least, think every day about the coming forecast if for different reasons. I’m probably in the minority but I love the long cold windy winter nights because for me that means comfort food. Stews and braises can be amazing if given their time. My favourite stew is a rich wholesome shin of beef with marrow bone. Long winter nights doesn’t always have to be about slow cooking though. 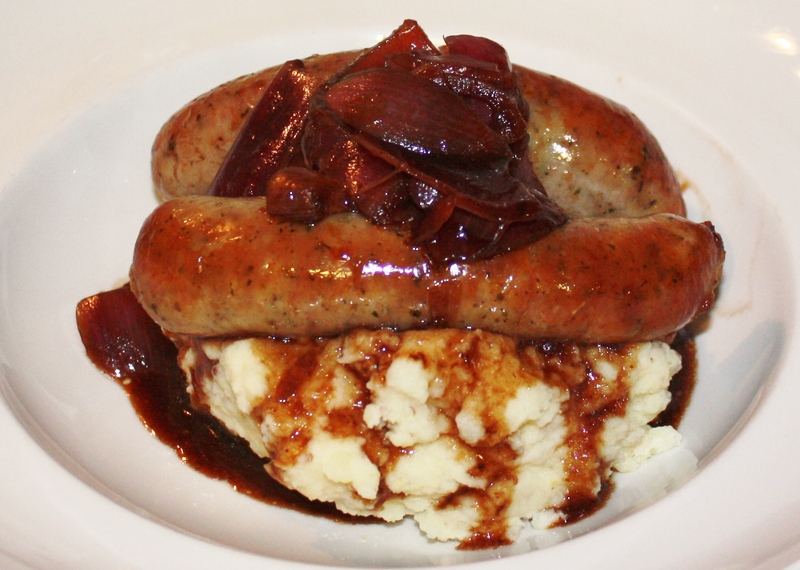 A recipe that we love in our house is the traditional bangers and mash, with compulsory red onion gravy. It is cooked in the length of time it takes to boil the spuds. 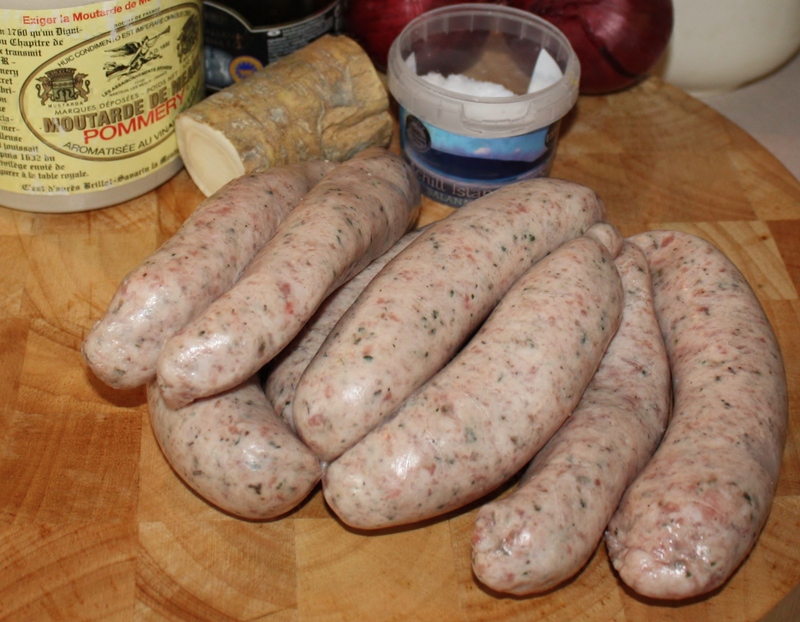 We use good herby Cumberland sausage for this but you can also use a traditional one. Buy the best sausage that you can afford. Sausages have for too long, been predominantly seen as a cheap source of meat in this country and the UK. Our European neighbours, on the other hand, have always respected sausage- making as an important and integral part of a butcher’s repertoire and have taken great care in their production. We have some wonderful sausages in this country now with some butcher shops developing and making their own, farmers making top quality sausages direct for their market stall and also more widely available brands such as Jane Russell’s and of course, Kelly’s of Newport. Note: The onion gravy recipe is a version of a Jamie Oliver recipe. I would recommend you choose the best stock you can find as some have a lot of salt and flavourings. Preheat the oven to 200⁰C / 400⁰F / gas 6. Place the sausages in an ovenproof dish and drizzle with a little olive oil to coat. Place in the preheated oven for 20 minutes or until golden brown. While the sausages are cooking, boil or steam the peeled potatoes until tender. Drain, and return to the saucepan. Mash until smooth. Add the milk and about 70g/2½ oz. of the butter. OPTIONAL EXTRAS FOR MASHED POTATOES – You can make an extra special mash at this point by adding a few dollops of wholegrain mustard OR 2 or 3 tablespoons of freshly grated horseradish. Both varieties work well with this recipe. Season the mashed potatoes well to taste and keep warm. To make the onion gravy, fry the onions very slowly in a little oil with the lid on for about 15 minutes until soft. Remove the lid and turn the heat up. As soon as the onions start to get golden, add the vinegar and boil until it has almost disappeared. Turn the heat down again, add the rest of your butter and add 565ml/1 pint of stock. Stir well. Let this simmer until you have a nice gravy consistency. To serve, dollop some creamy potatoes onto a plate, chop your sausages in half and place on top. Finally spoon over the onion gravy. And there you have a plate of pure rib-sticking comfort. All that’s left to do then is to talk about how cold it is outside!